Published on 11. December 2017. 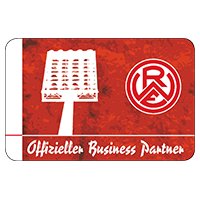 A total of more than 100 years of company history is spread over our two customers COLONIA (the name reveals it) from Cologne and CTS – Container Trucking Service GmbH, located in Ginsheim-Gustavsburg. The history of the Cologne-based company goes back to the year 1945. A good 30 years later, in 1976, CTS was launched. 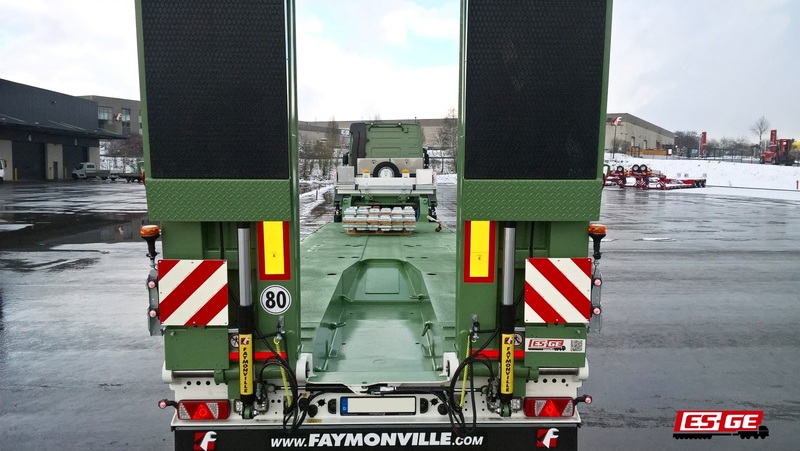 Although the two companies are not related to each other in terms of business, they have in common, that we have sold two Faymonville vehicles to both companies equipped with a newly developed PA-X technology from the Belgian manufacturer. 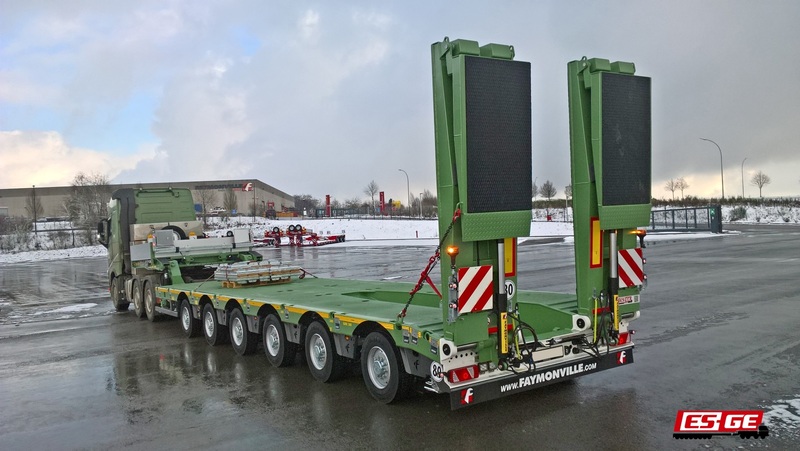 PA-X is a swing-axle system from the Belgian manufacturer Faymonville. Due to the particularly low overall height of the system, the minimum loading height of the newly introduced vehicle types and modules is just around 790 mm. Altogether, the swing axles can be raised and lowered over a range of approx. 600 mm. The maximum steering angle is 60 °. Both guarantee good maneuverability and excellent off-road capability. 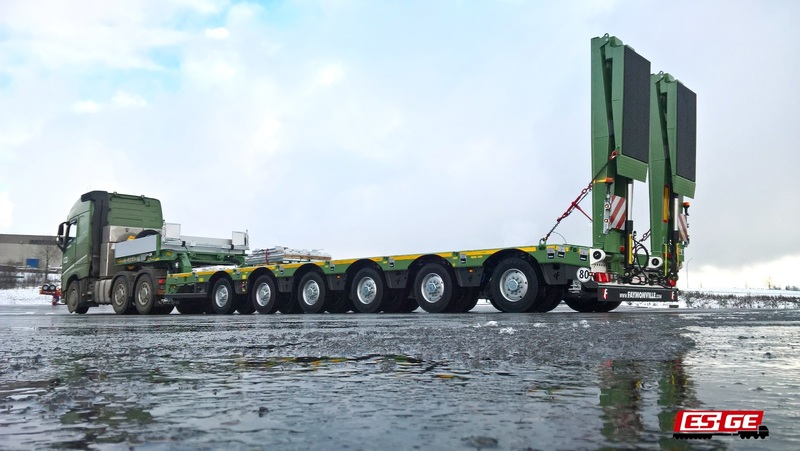 The axles are used in the semi-modular CombiMAX-PA-X system in conjunction with special CombiMAX PA-X modules (two or three axle lines) or with modules from the previously known CombiMAX series (two to four axle lines) with 17.5 “tires. When using the latter, however, due to the different height at the interface, a minimum shoulder of approx. 70 mm is created. In both cases, the special neck known from the CombiMAX modular system is used. 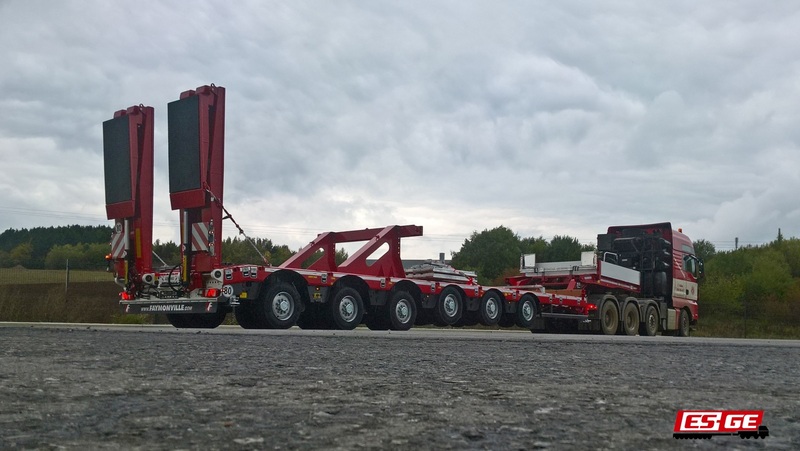 The vehicles are completed at the rear end with a PA-X platform with five, six, seven or eight axles. 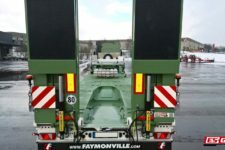 Faymonville also launched the wsing axles in the Multimax-PA-X series with a fixed neck. 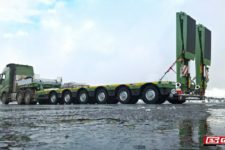 The semi-trailer is available in different axle configurations and is built with a vehicle width of 2,540, 2,850 or 3,000 mm. 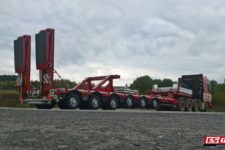 Possible configurations are ordinary 5 to 8 axles or also “2 plus 5” to “3 plus 8” with two or three counter-steered axles. 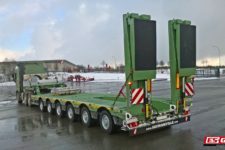 The semi-trailer can be ordered as a single or double telescopic unit and can be equipped with a hydraulic single or double ramp on request. As another possible feature, the loading area can be equipped with a 4,440 mm long, 440 mm deep and 900 mm wide recess, built for excavator arms.